The #1 clinically recommended topical brand, Biofreeze Professional is offered exclusively to professionals. An effective analgesic formula that contains ILEX and menthol, Biofreeze Professional is free of oils, waxes or petroleum. It effectively assists the treatment of contusions, muscle stiffness, spasms, back, shoulder & neck pain, arthritis, bursitis, stiff, painful joints. Can enhance: ultrasound treatments (mix with coupling gel), NMES treatments. Biofreeze contains menthol as its active ingredient (not as a scent). Menthol has a characteristic smell, which typically vanishes within minutes of application. You should never use a heating pad while using Biofreeze. Biofreeze works by causing a cooling effect, not heat. By using a heating pad in conjunction with Biofreeze, you may cause serious injury to yourself. You may not be able to tell how hot the heating pad is on the problem area, even possibly causing yourself to experience severe blistering. Biofreeze products provide relief to countless arthritis sufferers. The pain reliever’s unique, cooling formula is also comforting to sore muscles and muscle sprains; easing back, shoulder and neck pain; reducing painful ankle, knee, hip and elbow joints and helping to lessen effects of muscular strains. 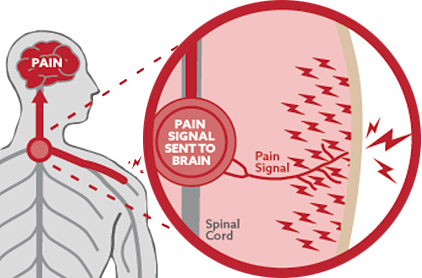 Special nerve receptors in the skin send a signal to the brain letting the brain that you’re in pain. When you apply Biofreeze which has menthol (the active ingredient), this creates a cooling sensation. 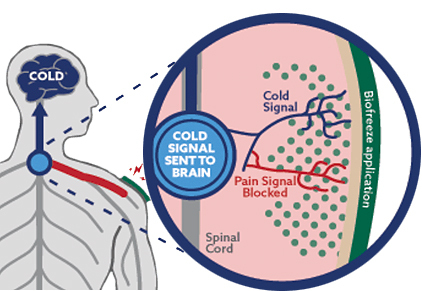 The cooling sensation then blocks the pain signal, and perceived pain is reduced. Biofreeze profesional is Non-addictive, NSAID-free & does not require a prescription. Biofreeze is made with USP-grade ingredients and is propylene glycol and paraben free. Biofreeze Professional features an easy-to-apply, smooth application with fast absorption for pain relief. Available in several formats to best suit your needs. The Spray is perfect to help apply to those hard to reach areas while keeping your hands clean. The roll-on is great for applying an even amount to the targeted area. Use the tube/pump format for quick easy access in a clinic setting.